Refresh Preservative Free Eye Drops help comforts irritated, dry and tired eyes. Suitable for all contact lens wearers. Like so many people these days, you may be taking an active interest in your health - exercising, watching your weight and being more careful about the ingredients in all the products you use. REFRESH® eye drops are preservative free and will not cause allergies or adverse reactions associated with eye drop preservatives. People with sensitive eyes and contact lens wearers can confidently use REFRESH® eye drops. Eye drops are prone to bacterial contamination and are therefore generally discarded 4 weeks from the time of first opening the bottle. REFRESH® eye drops are different. Each single-use container remains sterile until it is opened. Therefore there is no need to discard REFRESH® eye drops like bottled eye drops. Additionally, the single-use containers of REFRESH® eye drops are convenient and easy to carry. REFRESH® eye drops provide comfortable relief of irritated, dry and tired eyes. They can also be used for in-eye re-wetting of contact lenses. Suitable For: All contact lens wearers. For external use only. To avoid contamination, do not touch tip to any surface. If irritation persists or increases, discontinue use and consult your doctor. Each mL contains: LIQUIFILM® (Polyvinyl Alcohol) 14mg and Povidone 6mg. Instill 1 drop into eye(s) as frequently as required and discard unused contents. 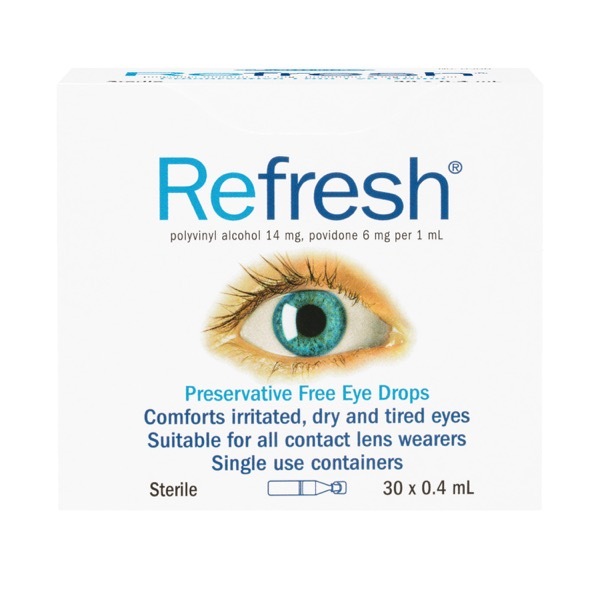 Refresh Eye Drops 0.4mL 30 is rated 4.5 out of 5 by 6. Rated 5 out of 5 by Lyn67 from Refresh eye drops I have had this for a fortnight and have received an enormous amount of relief from itching eyes from hayfever. Rated 5 out of 5 by oliviaaaa from easy to use i bought this a month ago and found it very easy to use. Rated 5 out of 5 by jackie78 from Great Stuff i bought this one. It is a great stuff. I do like.